Spring is just around the corner and people are starting to think Kentucky Derby. Thoroughbred horse racing just loves this time of year! More people will be watching this prep season after the rise in popularity of the 2014 Kentucky Derby winner California Chrome who just received two Eclipse Awards. For the horses, there are 35 races in the 2015 road to the Kentucky Derby at Churchill Downs in Louisville, Kentucky with 20 Kentucky Derby Prep Races (15 of these 20 races have been run – see results) and 16 Championship Series Races with higher points available. 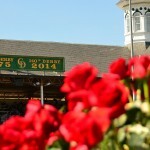 If the field is limited in size, the horses with the highest points will be in the Derby.